FROM THE PREFACE: The abundance of insects can change dramatically from generation to generation; these generational changes may occur within a growing season or over a period of years. 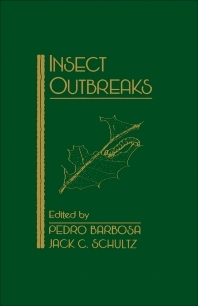 Such extraordinary density changes or "outbreaks" may be abrupt and ostensibly random, or population peaks may occur in a more or less cyclic fashion....The goal of this book is to update and advance current thinking on the phenomenon of insect outbreaks. The contributors have reviewed relevant literature in order to generate a synthesis providing new concepts and important alternatives for future research. More importantly, they have presented new ideas or syntheses that will stimulate advances in thinking and experimentation. Entomologists, ecologists, forest scientists, population biologists, and evolutionary biologists. Introduction to Outbreaks. The Theory and Classification of Outbreaks. Nonoutbreak Species of Forest Lepidoptera. What Is a Forest Pest? Leaf Eating as Mutualism. Community Structure: Natural and Manipulated Ecosystems. Insect Outbreaks and Community Structure. Community Structure and Folivorous Insect Outbreaks: The Roles of Vertical and Horizontal Interactions. Population Outbreaks of Introduced Insects: Lessons From the Biological Control of Weeds. Insect Pest Outbreaks in Agroecosystems. Agricultural Ecology and Insect Outbreaks. Biotic and Abiotic Factors in Insect Outbreaks.The Role of Climatic Variation and Weather in Forest Insect Outbreaks. Pathogen-Induced Cycling of Outbreak Insect Populations. The Role of Natural Enemies in Insect Populations. The Role of Weather and Natural Enemies in Determining Aphid Outbreaks. Amino Acid Nutrition of Herbivorous Insects and Stress to Host Plants. The Role of Drought Stress in Provoking Outbreaks of PhytophagousInsects. Evolutionary Consequences. Insect Population Dynamics and Induction of Plant Resistance: The Testing of Hypotheses. Geographic Invasion and Abundance as Facilitated by Differential Host Plant Utilization Abilities. Phenotypic Plasticity and Herbivore Outbreaks. Genetic Change and Insect Outbreaks. Evolutionary Processes and Insect Outbreaks. Each chapter includes references. Index.